We grow plenty of herbs in the garden but there are couple that thrive in my kitchen. 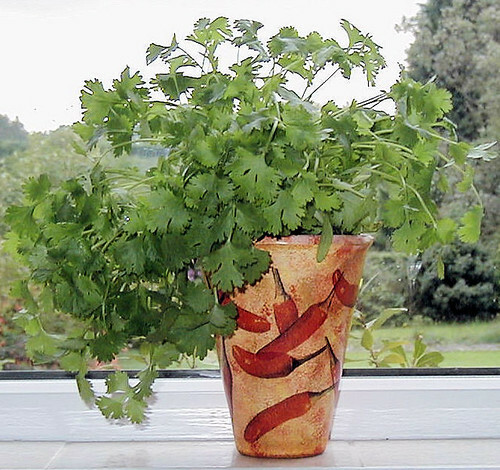 Fresh coriander is one of those herbs that you either love or hate - I use it mainly in curries and Mexican cuisine. As well as a pot of the fresh stuff, I have a frozen supply in the freezer. Basil is in the other pot and the smell wafting up from it is divine. 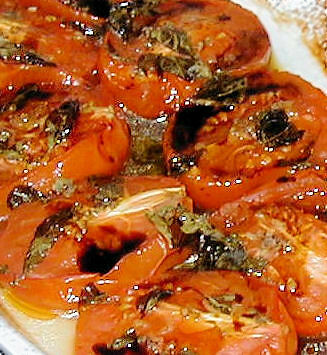 One of my favourite dishes is Roasted Tomatoes with Basil, perfect with bread to mop up the juices. Just take large plum tomatoes and slice in half - you can skin them first it you want. Place in an oven proof dish, cut-side up and spread a little chopped garlic on each cut side. Tear up a handful of basil leaves and lay on top of tomatoes. Dribble a tiny amount of olive oil on each one and roast for a couple of hours in a low oven. To serve, whisk a tablespoon of olive oil with a tablespoon of good balsamic vinegar and drizzle over the tomatoes. 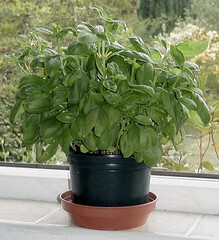 I'm going to get some more herbs to keep in pots on my window sill after I get back from my holiday. I have fresh herbs on the windowsill up at the big house that I use all the time, plus a very prolific herb garden by the conservatory door that I avail myself of quite often as well. I just love using fresh herbs! Your Roasted tomato salad looks divine! Hi chef jp - thanks for stopping by! You are spot on about fresh tomatoes from the garden - absolutely delicious. They truly are the food of the gods! I have a nice selection of herbs in a flower box just outside my kitchen window, and then more in the garden, I love fresh herbs. Hello Brilynn - Great idea to put them in a flower box.